Belitung Island has nearby small islands. All of them are worth to visit. For those who love diving, you can visit Lengkuas Island. It offers an unparalleled marine beauty. Apart from the fishes, there is the wreck. Many tourists come to Lengkuas to enjoy Indomarine Wreck. This diving spot is situated in Tanjung Kelayang Island. It is one of the archeological sites in Bangka Belitung Province. Today, it becomes one a popular vacation spot in Belitung Island. Even beginners are allowed to do it. When it comes to the atmosphere, the beach is as beauty as other beaches in Belitung. Though, it offers more interesting features. The best one is the shipwreck. It is the reminiscence of an old ship. No wonder, it is covered by alga and corals. This rustic ship becomes a distinct attraction for divers. It is worth to explore, as well. You can dive in and take some pictures of the ship. On top of that, the water has an amazing visibility. It is true beginners are allowed to explore the wreck. Still, you can’t dive in carelessly. It is better to come with an instructor or friends. At least, you should have learned the wreck-diving basics. It is a different type of diving activity, after all. The most important thing is the mooring line. You should follow it carefully. The line is the safest path between the wreck and your dive boat. Not to mention it is your shortest path. Never overlook this basic! When conducting wreck diving, you should recall where you started. Some beginners make a mistake once they descend. They forget their location. This mistake can lead to numerous problems, so you should be careful. Next, you should take advantage of the current. The best way to dive is with the flow. Even though it takes much effort, you will have a smooth return later. The current provides an easy ride back to your boat. Many professionals do this trick, after all. Also, make sure you have planned your dive. Indomarine Wreck is a little bit uncommon for foreigners. It is better to conduct a small research prior to diving in. An instructor can be a big help. This costs you some money, though. Another important consideration is the gear or equipment. Make sure you wear proper equipment for wreck diving. It protects you against rusted metal, sharp objects, and numerous harmful things in the sea. Even an underwater flashlight is important. 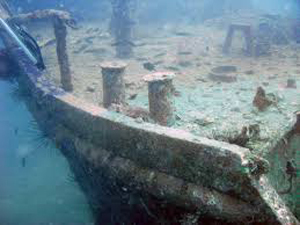 Wreck diving in Belitung Island becomes a challenging activity for tourists. Though, everyone shouldn’t be careless with it. It is easy to reach Indomarine Wreck. You only need to head to Lengkuas Island. Your first destination will be Tanjung Kayang Beach. From here, you can rent a boat to go to Lengkuas. One thing, there is no accommodation in Lengkuas Island. If you want to rent a hotel room, you should have done it in either Belitung or Kepayang Island.